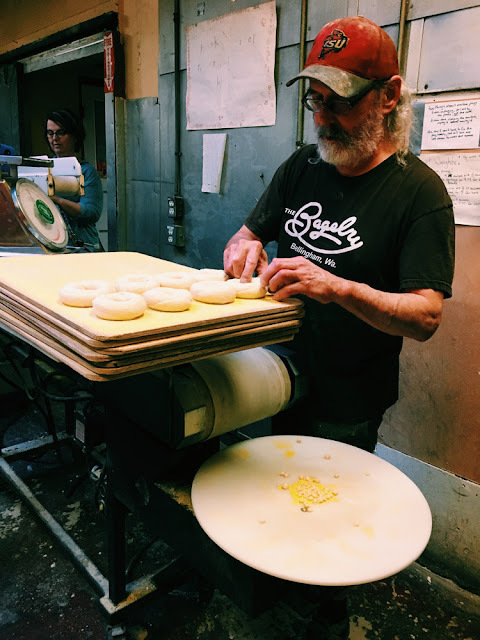 A couple of weeks ago due to a cool program called Morning Jam put on by our Downtown Bellingham Partnership I was able to go on a behind the scenes tour of a Bellingham Landmark, The Bagelry. I've eaten at the Bagelry in all seasons of my life. I discovered it as a student at Western, continued eating there for lunch when I worked downtown, and found bagels made my growing family happy. So getting the chance to go behind the scenes felt a bit like the Wizard of Oz! Ready to see the magic? First, a little background. The Bagelry has been in Bellingham since 1984. 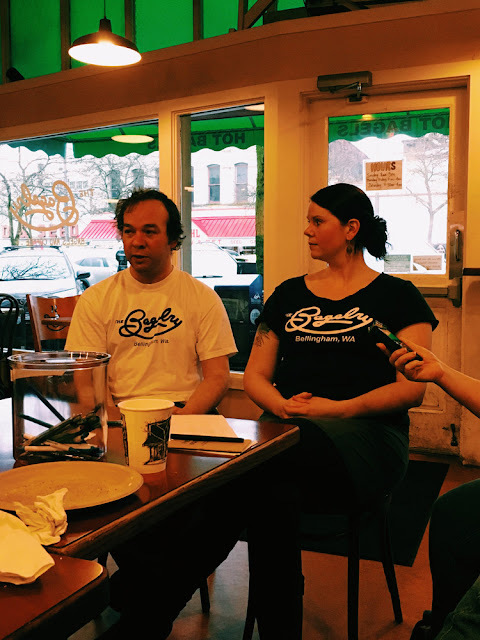 The original owners sold to Aaron & Terra Seaton, longtime Bagelry employees who took ownership in January of 2016. 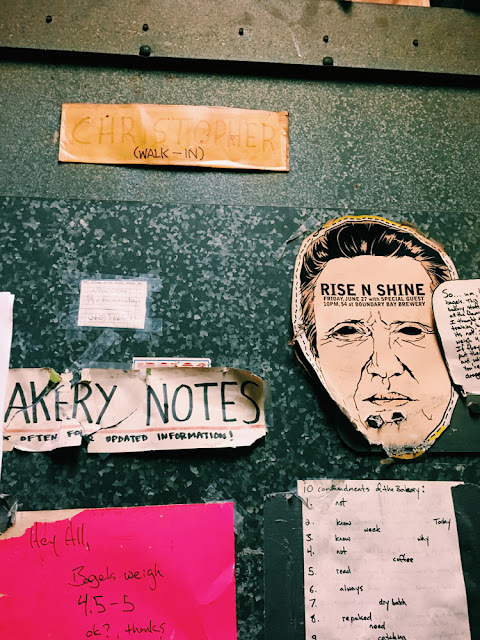 They have kept things as they were, with the understanding that with the shop being such an institution customers would expect things to stay as they are. But they are adding and tweaking here and there. 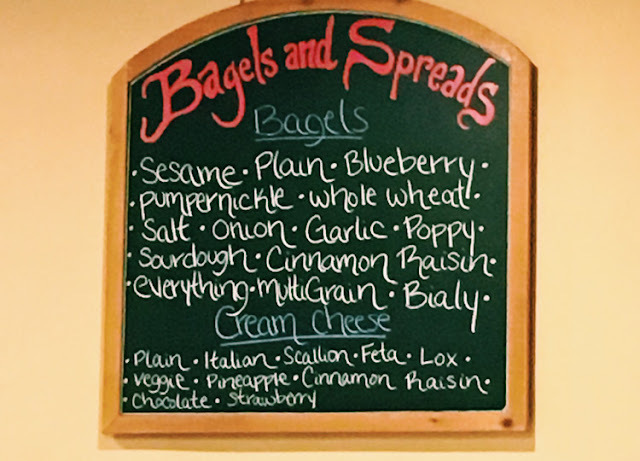 They have introduced seasonal bagels, such as a salt-rosemary one that is amazing! And there are thoughts of a bagel truck down the road. 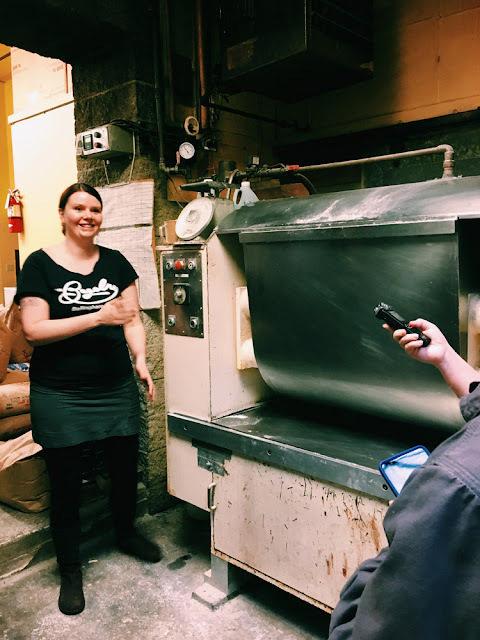 Terra took us on the tour and the first stop was an introduction the main ingredients of bagels. They list is short...flour, salt, sugar & yeast. And then just water. 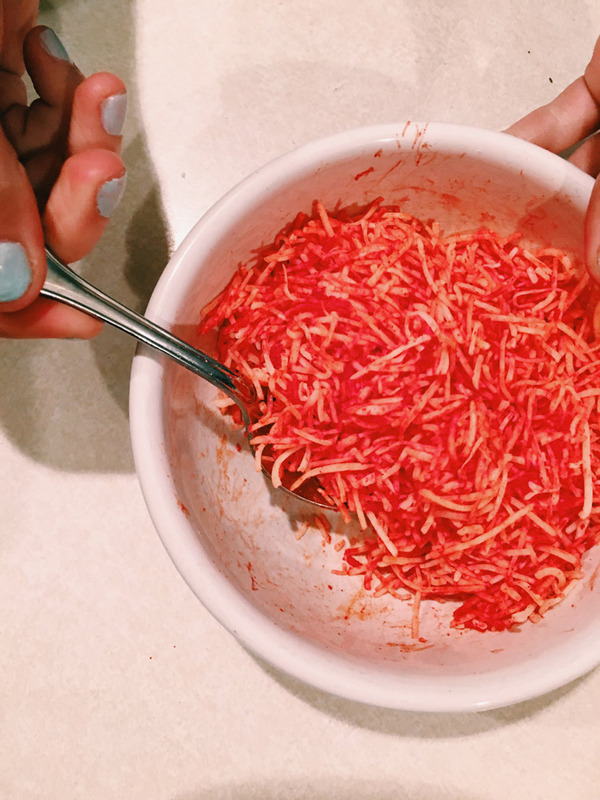 What they make of those humble ingredients is nothing short of magic! The ingredients spend time in this huge mixer. Terra said that the main mistake that happens with bagels is loosing track of what has been mixed into the mixture...did they forget the yeast? Too much sugar? Mistakes are rare, and become apparently rather quickly! This is the stage where the ingredients take shape. 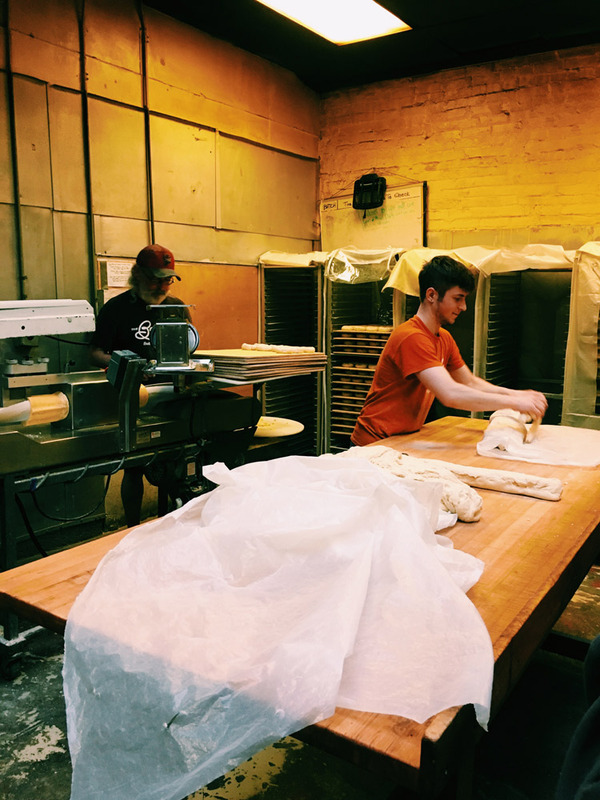 The bagel dough is rolled out on the table, cut into workable bits, then sent thru the machine in the back to start the shaping of the bagels. I have to say this is the point where things get exciting! 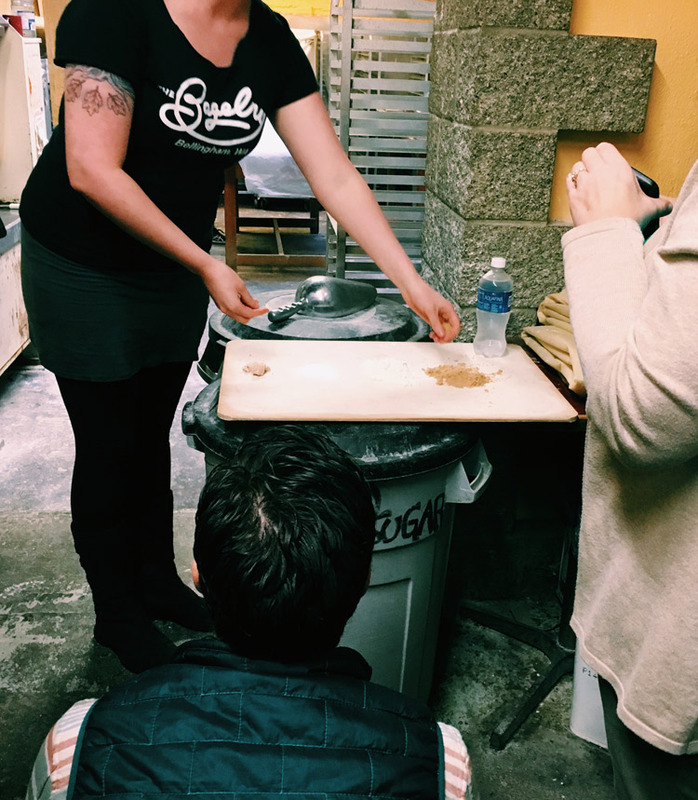 The bagels are formed quickly and it's mesmerizing to watch them being formed. 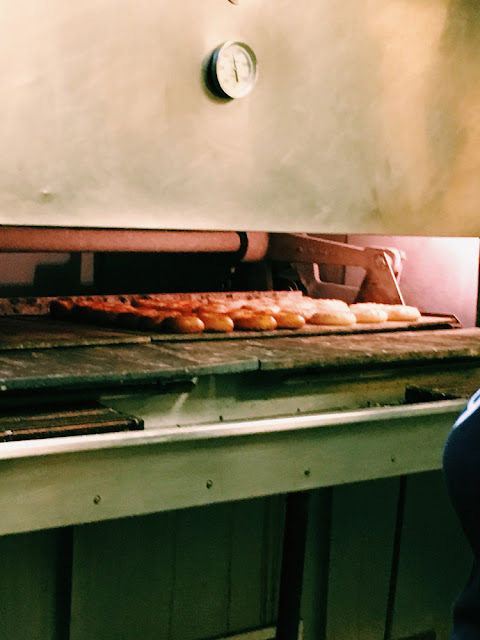 Once they are, they are set on trays, and sit on trays to rise. The time they spend on this step depends on the type of bagel. Needless to say, there are tons of bagel trays happening. Once the bagels have had time to rise, the then go into a quick bath in boiling water, then they get fished out and get their run in the oven. This job looked so stressful, but the baker did it with grace and speed. 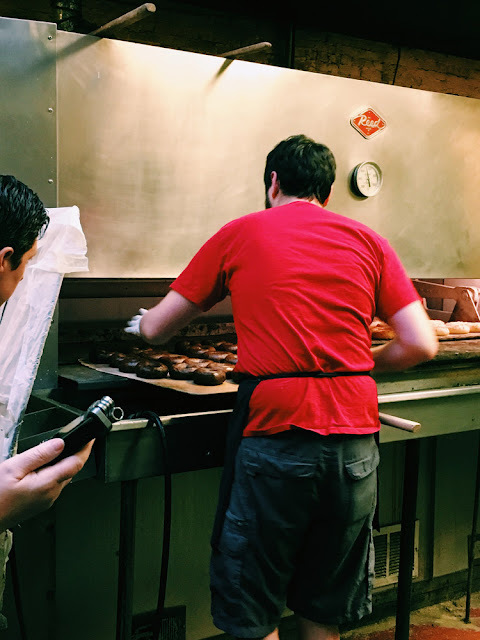 There are many trays of bagels moving at this point. Being boiled, being set on wood flats with seasoning, or being run thru the oven. We were all shocked to find out that 2,000 plus bagels are sold a day! This amount is managed by 38 employees that are there at various times of the day, doing various jobs. Nothing like a warm bagel! Of course we left the tour craving bagels, and took we took some back to friends at work. And seeing these photos again, I'm craving one now! The Bagelry sells many different bagels, spreads, and sandwiches and is open seven days a week. Cash only. I'll leave you with this silly photo from the kitchen...the "walk-inn!" I'm off to see if I can talk my husband into a bagel run! Yay! It's the first day of Spring! To celebrate I wanted to bring you some rainbows. I mean we've had plenty of rain right? It's time for things to turn. And if I can't promise the type in the sky, we can do one better. How about tasty, cheesy, yummy ones? We actually tried this last week for an early St. Patrick's day celebration, but I think they are useful for so many days...you had a bad day and need a pick me up. A colorful party nibble. A Unicorn party. Or just because. Did you grow up in a family that would occasionally color their pancakes? Steve is and has fond memories of it. I consider this the 2017 version of colored pancakes! We picked up two packages of shredded white cheddar cheese (over 2 cups worth), and also bought sourdough bread. We already had the food coloring on hand. 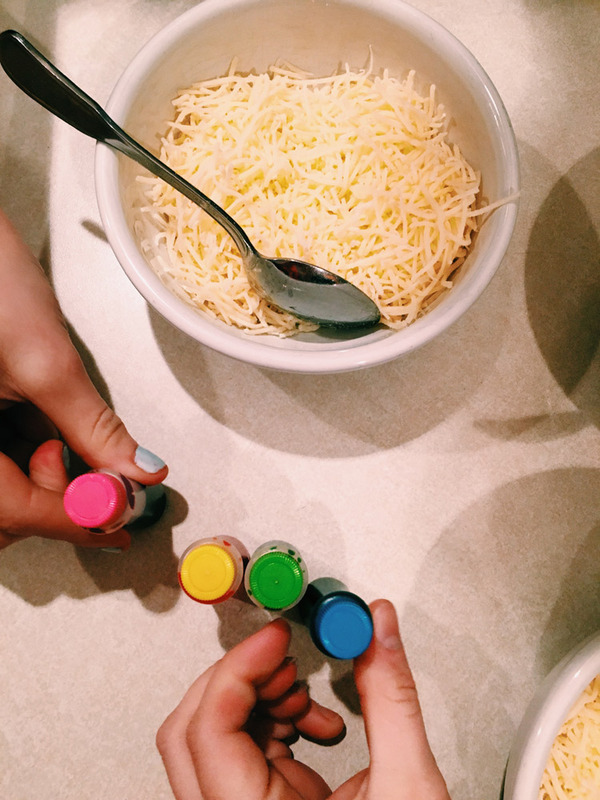 We decided on four different colors so we just separated the cheese into bowls and added the food coloring based on how vibrant we wanted the color (about 5-7 drops a bowl). 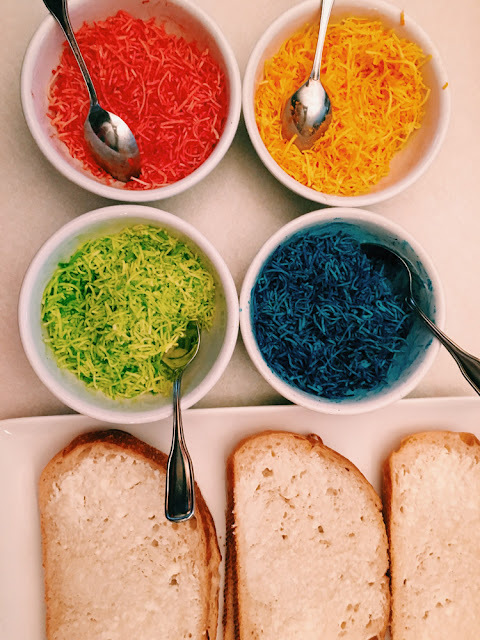 Then it is just a matter of arranging the grated cheese in a rainbow pattern on the bread and grilling it up. 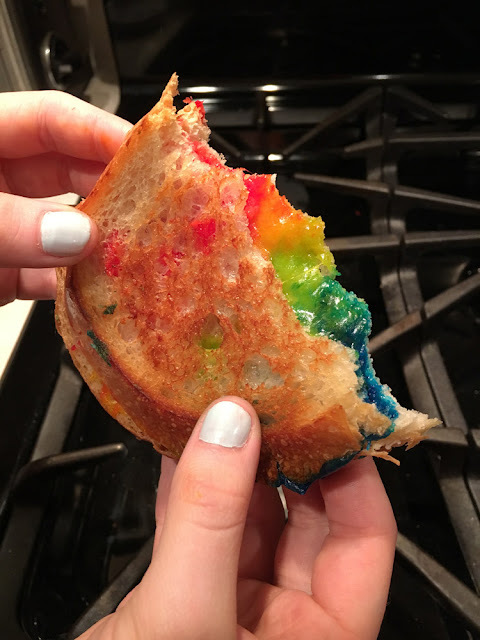 I found the only tricky part was making sure not to drop a bunch of colored cheese in the pan when setting up your sandwiches in the pan. Once you have the cheese in place it's just time to grill them up and enjoy! We had a bunch of fun cutting them partially and pulling them apart to play with the cheese! 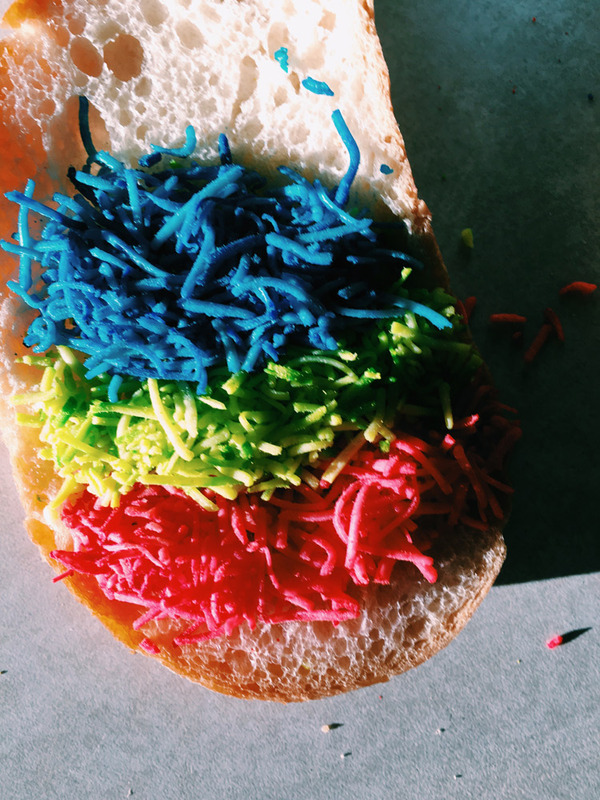 And of course you are left with colorful, cheesy sandwiches. So, here's to Spring and the sighting of many rainbows! Real or otherwise! Every once in a while I get the itch to personalize my clothing. 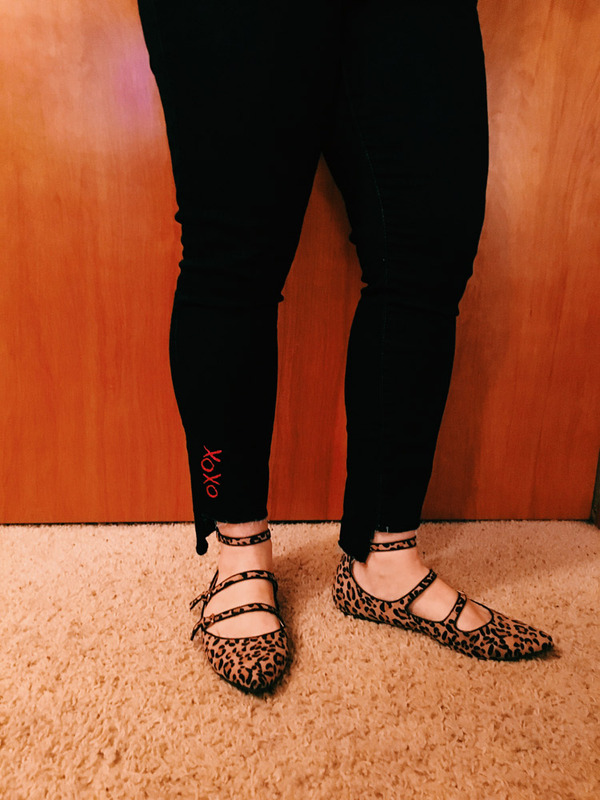 My daughter Samantha has been using embroidery to add a touch of fun to a bunch of different outfits and once I saw the above photo in an e-mail I knew I wanted to try my hand at it! Using google image search I was able to find where the photo came from. It happened to be from a DIY from Honestly WTF which was really helpful! 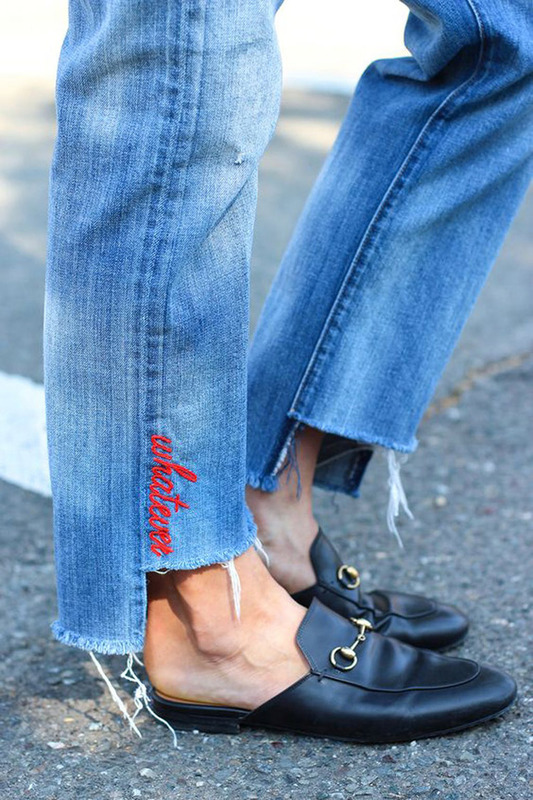 I bought the jeans at the Gap and being somewhat on the short side I had no problem with cutting off the hem. I just did a bit of a freehand and thankfully it turned out even! I have teased that my daughter is somewhat of an impatient crafter and I think that may apply to me as well! Samantha had all the supplies I could need. I did a small tracing of the lettering with a white pencil I had to give me a guideline. And then I just went for it. 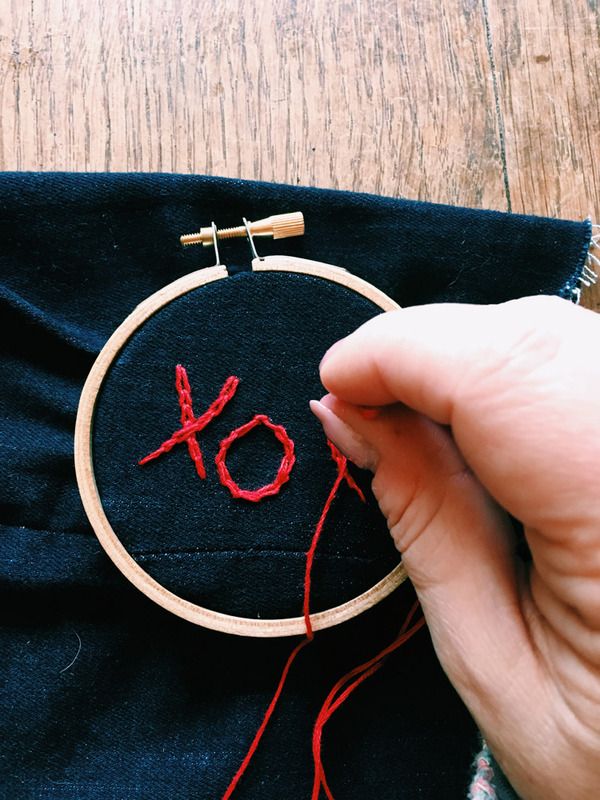 I tried using a chain stitch which is well illustrated in the Honestly WTF link. 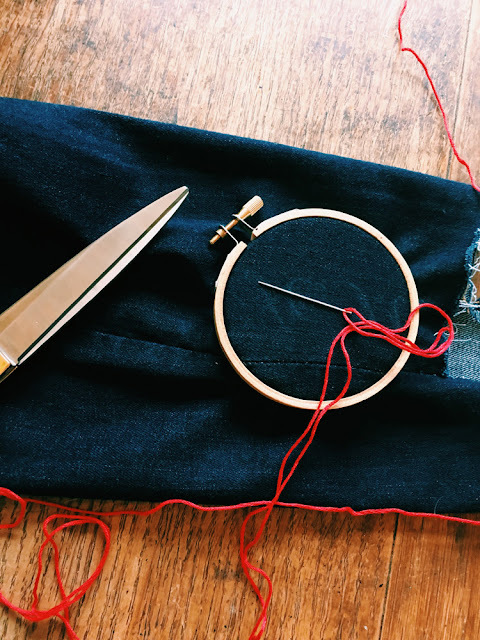 Once you start it's a pretty easy stich to master. Once started things moved along quickly and I think I was done in about 20 minutes! 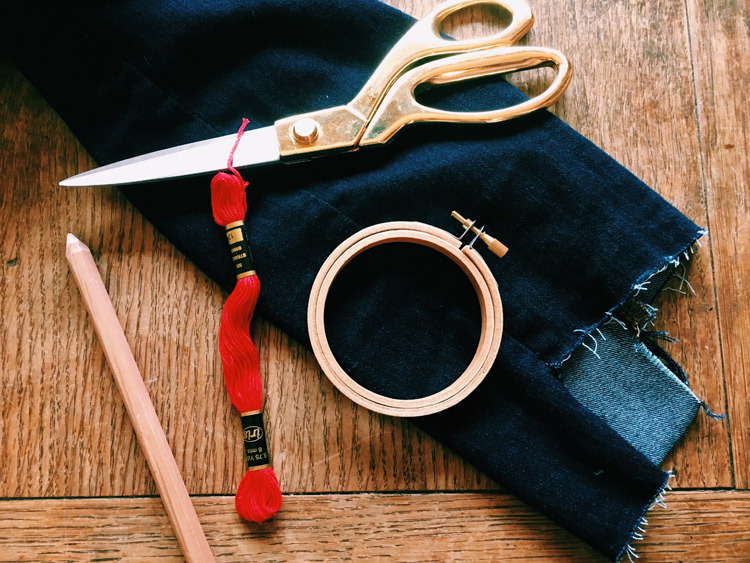 I was pretty happy to have made a regular pair of jeans into something a bit special. The ease of doing this has me dreaming of tackling a bunch of other projects! I'm thinking t-shirts or sweatshirts will be next. Studio DIY has another great guide with pointers on how to set up a template when I get to those! Do you see yourself trying anything like this? Recently Steve and I made a lifetime dream happen. We have heard of a lot of unfortunate events near us that made us realize that the time is now to make things happen. And something we had been thinking of doing for some time is visiting Treehouse Point. 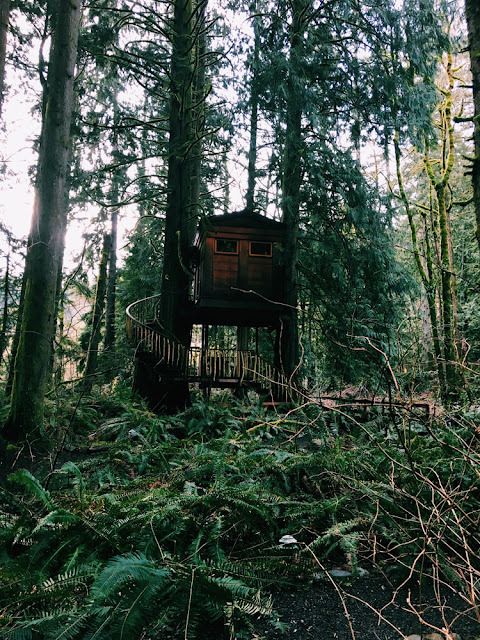 Who wouldn't love sleeping in a treehouse? And that they are available as near as Fall City what were we waiting for? The minute you drive onto the property you feel transported. 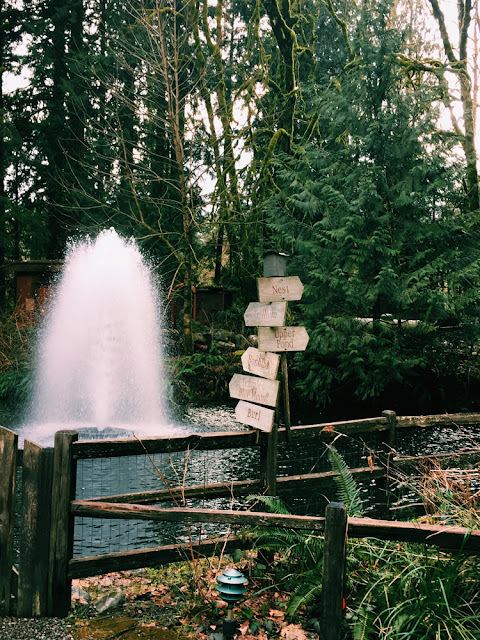 The grounds are gorgeous and a bit wild, with a centerpiece of a fountain. You can see a treehouse or two right when you pull in. And the lodge is welcoming. Steve was happy to find it was a source of homemade cookies and other snacks! They also have a small merchandise area in case you need something to commemorate your stay. The greeting is low key and welcoming. We were told how the gate works (apparently they had to install one and create a tour program to help balance those that were curious about the treehouses with privacy of those that are staying in them. Everything is secured with codes which makes it really easy to get around and into your treehouse. And then it's on to your treehouse for the night! We had secured Bonbibi for the night and were happy to find it's in a fairly quiet area on the property. It does not have it's own bathroom but there are two full bathrooms at the base of it with heated floors and showers! 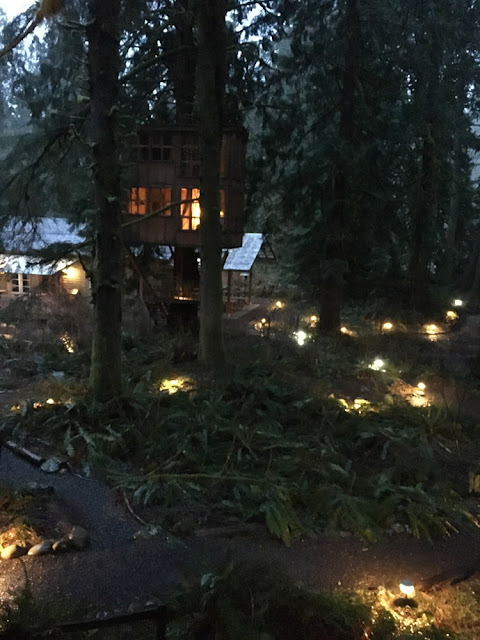 The grounds and the treehouses have wonderful lighting with some on motion sensors or timers. It makes for a quietly relaxing environment. Nothing takes very much thought and it feels like you are in Narnia, or the setting for the Hobbit. The rooms have most things you could think of provided. 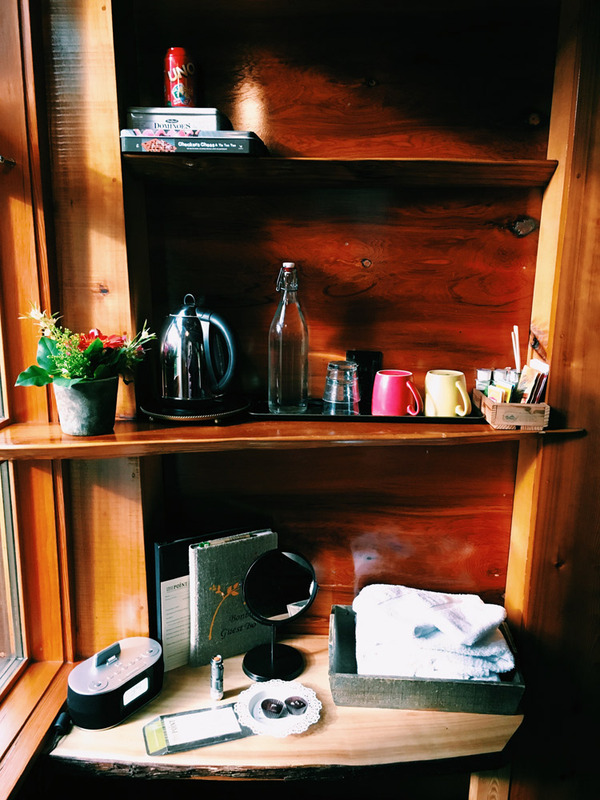 All you have to bring is basically warm clothes and plan for your meals, besides the breakfast they provide. There are games, gorgeous flowers, and ice chests if you would like the use of them. 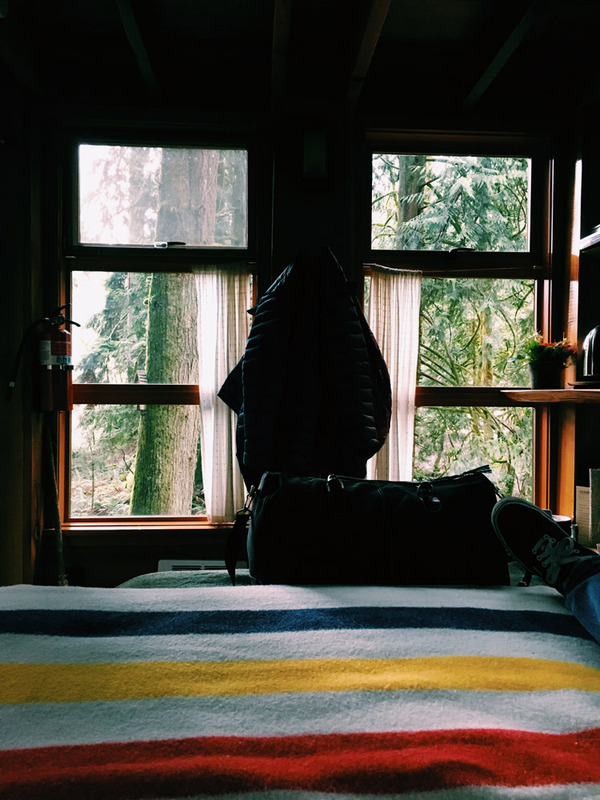 When we moved in we opened a window, threw the big woolly blanket that we brought, and threw ourselves on the bed to just take it in. 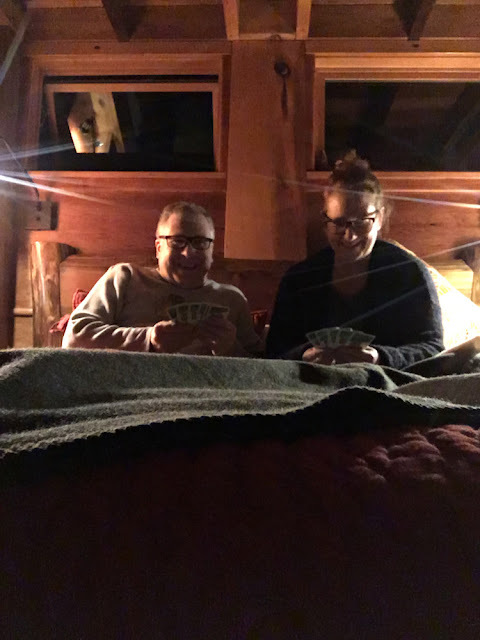 I think the window stayed open the whole time we were there (the treehouses are fully heated) so that we could listen to the river and the wind. Steve just relaxed while I took a little snooze. Being in this sweet little space was a bit like being on a boat. Listening to it rain and just hanging out was enough. The last time we were able to hang out together like this had been ages. I don't remember being so relaxed. Aside from leaving for a bit for dinner at the nearby Fall City Roadhouse (that just happened to be used in Twin Peaks!) we were back to just hang out. We ended up playing games until late and enjoying the sound of the wind and rain in the trees. We were able to keep a window open all night and were still toasty warm with the heat. We woke to the magic of snow falling which made the visit complete for Steve. They serve a wonderful breakfast at the Lodge where there are so many options, vegetarian and otherwise. The staff helps break the ice by joining in with coffee and encouraging everyone to visit one another's treehouses, though we were with a shy group and no one took us up on it! (we were hoping to get a glimpse into Temple of The Blue Moon!) 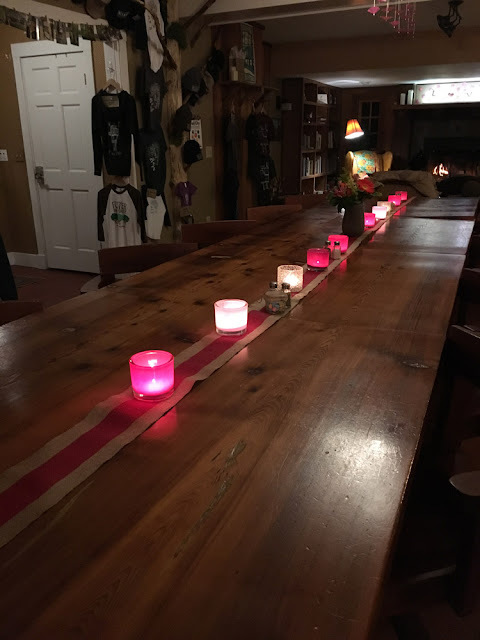 It was suggested by one of the staff that people tended to mix a bit more in the summer around the fire pit that they provide (along with s'more fixings!) and tend to keep to themselves a bit more in the winter months. 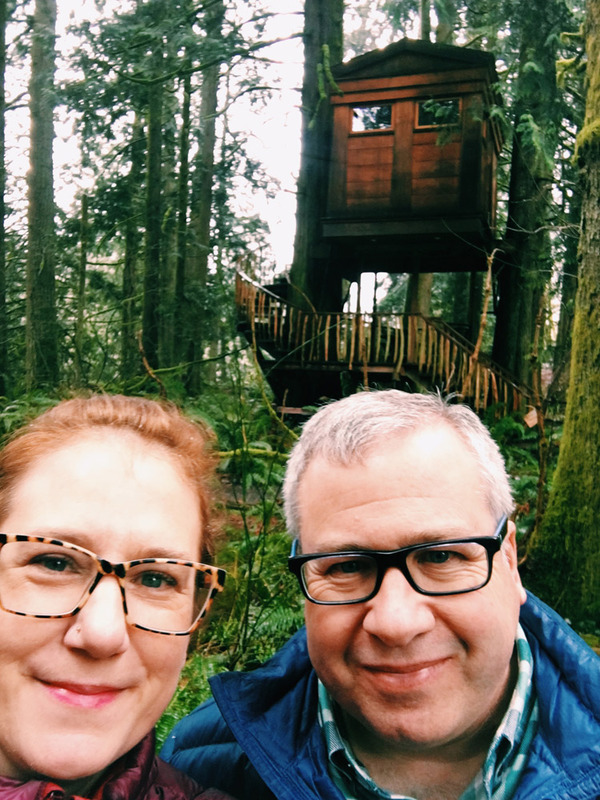 No matter, we were so happy with our time in the trees. Let me know if you end up heading there yourself!